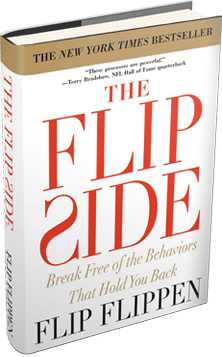 Brad McCoy here at The Flippen Group was an extremely successful high school football coach for over two decades. I’m always fascinated by his stories and the techniques he used with those players. A few years ago, I was with Brad at a game. Not just any game, but his team was in the Texas state championship. Sounds exciting, but his team’s play wasn’t so exciting and thus Brad wasn’t very happy. During halftime in a smelly locker room, he spoke to the team and told them something I will never forget. He asked, “How many of you have ever played in a state championship?” No hands went up—just awkward silence. None of them had since this was their first time in the state finals. Then Brad said, “You boys have all been here…that’s where you were for the first half of this game. Now that you have played in the finals, let’s get out there and win!” It was a great reminder to me that when we think we haven’t done something before, odds are good that we have to some degree and that all that is left is for us to perform like we have been there and done that. All of us have both experience and success we can leverage, so remind your self of that and let’s see where it takes you.